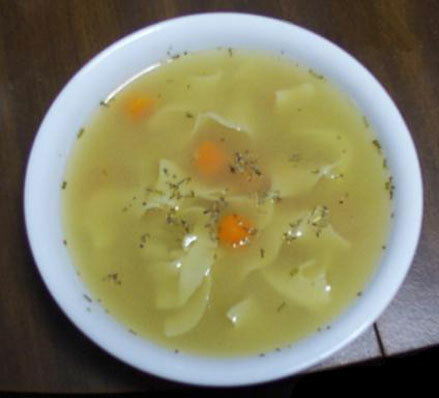 This is an incredinly easy chicken soup recipe for you to try. It takes under and hour to cook and less than 15 minutes preperation. I hope you enjoy it and I'm sure you will but if have anything to add that will make this recipe even more tast then please let us know. This recipe serves two people but simple adjust the amount of ingredients to suit your needs. Tip: If you have any let over vegetable then feel free throw them in as well. Idealy you want to have a good amount of chicken stock already but if you do not then just get an chicken carcass and soak it in water. You can also use some cooked chicken breasts but you will need to shred them a bit to help release the hidden flavours. So, simmer your carcass (or whatever you're using) for about an hour with slat and pepper. (Skip this step if yopu already have some chicken stock). Chop up the vegetables and the garlic and onions. Find a big frying pan and fry the onions and garlic for about 3 minutesand then add the other vegetable and fry gently for another couple of minutes. Filter the water that the chicken has been in and pour into a saucepan. You can also pick of any bits of edible chicken if you like. Add the slightly fried vegetable and onion to the saucepan. and bring to the boil. Let it simmer gently for about 45 - 60 minutes. Serve with warm bread or soup noodles. Garnish with fresh coriander. It really is that easy. If you feeel the need to add salt and pepper feel free and of course any other ingredients that need using up! Thats what a soup is for right! !